Today it’s my pleasure to tell you about a new collaboration between Angela Walters and Christa Watson. Both girls are fantastic quilters, as I’m sure you’re aware! Their book, The Ultimate Guide to Machine Quilting, talks about machine quilting from the perspective of a long-arm quilter and a sit-down quilter. Within the book there are 10 pieced patterns and 50 different quilting motifs. For each pieced pattern, both Angela and Christa show their own quilting designs. Through which they instruct, coach, and advise. Good stuff. This book is a unique concept in that it combines the 2 types of quilting (long-arm and sit-down). 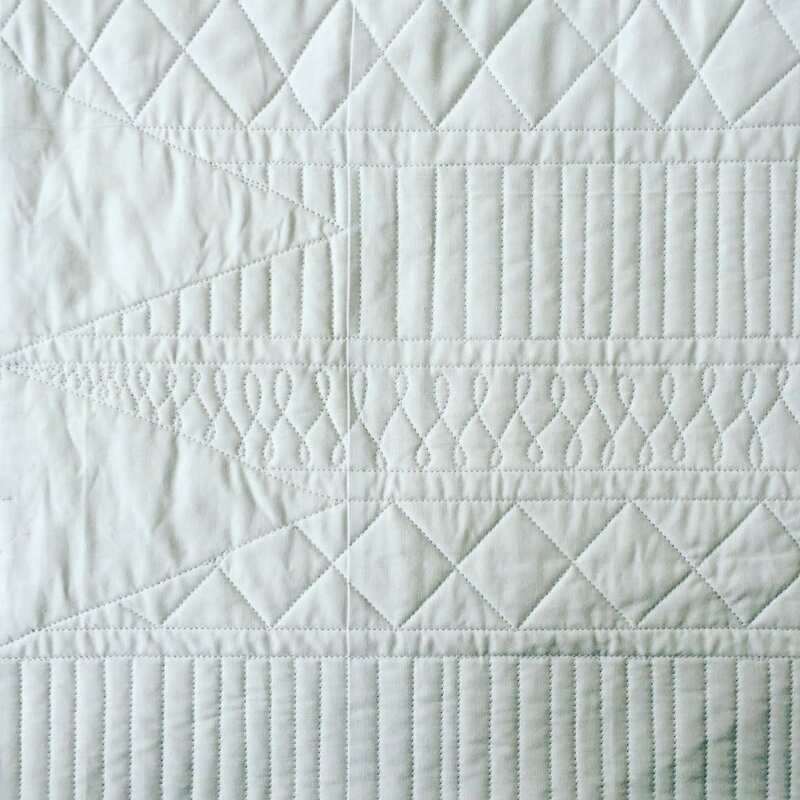 As a newcomer to long-arm quilting, I am constantly learning new things about long-arming. I tend to be fairly compartmentalized in my thinking so I will typically seek out only long-arm resources. 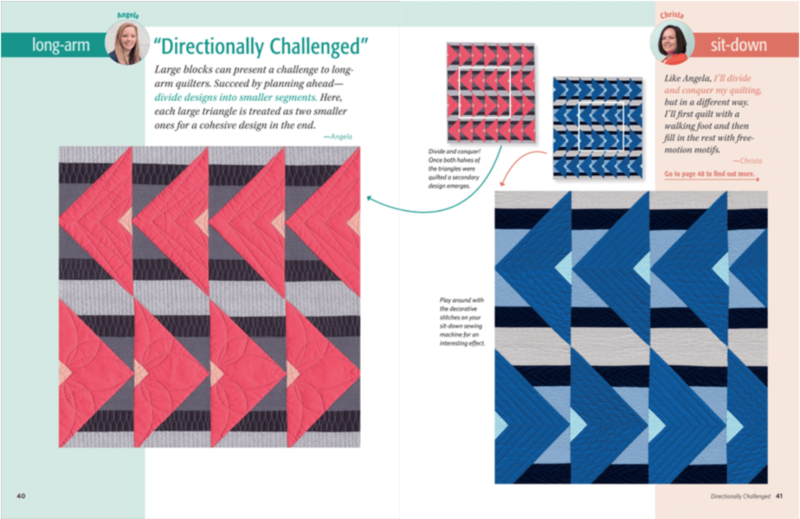 As I read The Ultimate Guide, I was pleasantly surprised to realize that I could apply Angela’s and Christa’s advice, tips, and motifs to both my long-arm and sit-down quilting. It’s such a novel and elegant concept for a book. The “Directionally Challenged” pattern and quilting provided the quilting inspiration for the quilting below. (Sorry, I can’t show more yet!) I had this large, intimidating swath of open space that needed quilting. I was dreading tackling such a large piece without a plan. I took Angela’s advice and divided it into sections and the quilting went over much more smoothly. Naturally, this rainbow quilt, “Choosing Colors”, called my name. What a fun pattern! The quilting is pretty great too. Love it! 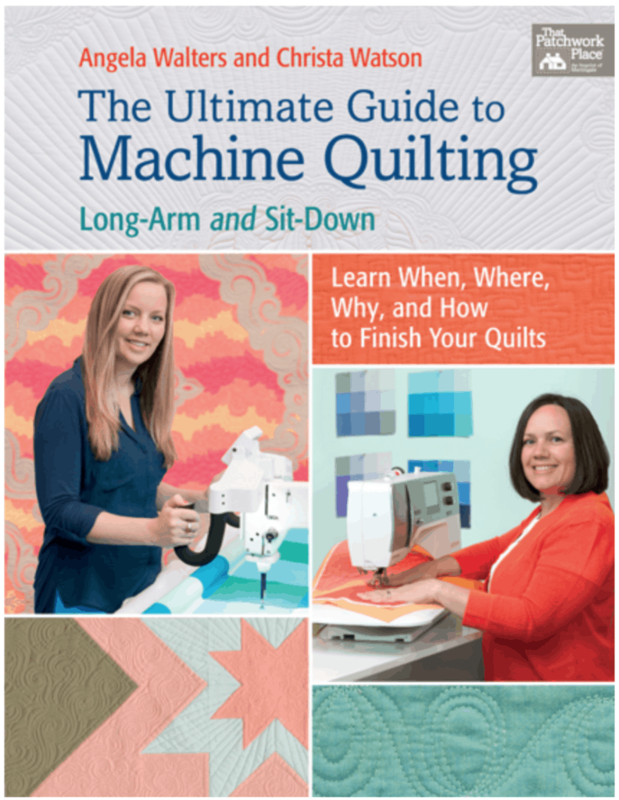 Whether you are a long-arm or sit-down quilter, I think that you will enjoy this book. You too may find that reading the “other” perspective might generate some new ideas. This is for sure a book you’ll revisit again and again. Purchase signed copies from Angela or Christa. 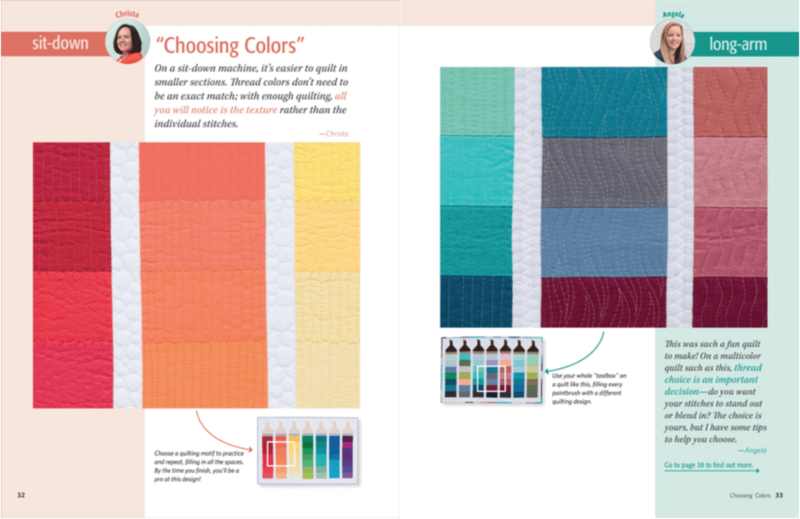 You can also order copies from the Martingale website or visit your local quilt shop. You are so right! Thanks for pointing that out. Off to fix it! Thanks for the love! I can’t wait to see what you are up to – the quilting looks fantastic!! Great question! I always mark my quilt tops. For this one I used a blue fabric marking pen. I think it’s called “mark b gone”. See you soon!